The little blond-haired girl loves to play outside. Sometimes she’ll try to drag her sister outside with her, but her sister usually wants to read or practice the piano. Watching television is rarely an option; their tall outdoor antennae only manages to catch about three channels out in their small town. Plus, their parents have strict rules about what they are allowed to watch. During the day, the girls will sometimes watch Sesame Street with their baby brother and sister. Forget about watching The Dukes of Hazard or Charlie’s Angels. Even though the kids at school talk about those shows all the time, the girls are only allowed to watch shows like Little House on the Prairie and Laverne and Shirley. In the little girl’s eyes, however, the best adventures are found outside. She has become very good at imagining stories while playing outside by herself. Play dates only exist if the neighborhood kids happen to be outside at the same time. Moms are too busy with laundry and dishes, sewing and vacuuming to call other moms to arrange for playtime. If the little girl wants to play with a neighbor, she needs to arrange it herself by ringing the doorbell and asking whoever answers, “Can Jackie come out to play?” She is shy and rarely walks up to that door. Bounding from sidewalk square to sidewalk square, either barefoot or in her wedge-heeled, white-strapped sandals, the little girl recites in a sing-song voice, “Step on a crack, break your mother’s back!” She races to the large maple trees in front of her house and tip-toes around them, balancing on their great big roots that push out of the dirt. Poking a stick into a soft spot at the base of the trunk, she sees ants scurry out, disturbed by her curiosity. Running to the front porch, she collects her companion for the afternoon. She has tied a piece of yarn around it so she can drag it behind her or twirl it around her. It is her very own pet rock. Where the rock came from she doesn’t exactly know. It fits perfectly in her palm, a black oval with bits of sparkle. The whitish bump to one side keeps the yarn from slipping off as it bounces along behind her. The commercials for pet rocks show them in small boxes with air holes, but she prefers her free rock. Even though she never gives her pet rock a name, she keeps it with her for years. It is always a good companion; it never whines or complains. Surprisingly, her rock sometimes comforts her just as a good companion should. As she is about to write a story about her pet rock, Ginny is amazed that she is able to find it in the last place she remembers seeing it — her memory box. After all these years, I still have my pet rock. Did you write a post about a childhood fad? Please link up your post’s direct URL in the linky tool below. The linky will be open until the end of the day on Thursday. In your post, please include a link back to Lemon Drop Pie. Thank you! You may use this prompt in a variety of ways: Record a memory from your own childhood. Remember a story told by your parents, grandparents, other family members or friends. You may also record a story from your own children’s past (or present) to help them remember their childhood when they are older. If the person you want to write about is still alive, use this prompt as an interview question. Most of all, have fun recording the memory and remember, your story is worth telling! Oh and now following you! Love your writing SITStah! I haven't written about a fad but I have written about a rock. (My gratitude rock which I found in a coat pocket after losing it for a while). Sorry I missed your link-up but looking forward to checking out more of your blog! Ok, Ginny, you really must stop writing about my life. Seriously, it was beautiful, sweet. Thanks for bringing back some nice memories for me while sharing yours. Take care of your rock! You still have the rock! That's amazing. Laverne & Shirley was one of my favorites growing up. I still have a soft spot for Penny Marshall. Lovely snapshot of your childhood. That sounds a lot like my childhood – I had to find my own friends, make my own fun. I never did have a pet rock, though 🙂 Maybe I'll go in the backyard and get myself one right now! It's never too late, right? I LOVED Laverne and Shirley!!! Nice story. Thanks for stopping by my blog! Love this! I had a very small pet rock that I named "Fred". I don't think I still have it. When I was a child, the fad was slap bracelets, and those Hyper Color shirts that changed colors in the heat. Memories! Stopping by from SITS! First of all, that was beautifully written. Second…I love that you HAD a pet rock, much less kept it all these years! Wonderful. Your childhood sounds a lot like mine. I even had a pet rock! I have no idea where mine ended up but that's neat that you still have yours. Ginny, What a beautifully written recollection about a piece of your childhood! So funny you mention your three TV station selections. When I was growing up, we only had one station with decent reception! Isn't that crazy? Love the part about your pet rock and that you wanted it to be free. Really a sweet post. Thanks for sharing some memories. I wasn't sure it was going to be you the story was about. I love that! What a great trip down memory lane. I would love to write a post like that, great idea. Will do soon! We could watch Dukes of Hazard but not Laverne and Shirley. 🙂 Charlie's Angels – never. Don't blame them on that one. That's so funny. I have kept a rock I found in Yuba City on a vacation years ago. This place has great fishing and an area where I could walk along the rocks to keep cool. I found a really smooth rocks ( I love colored rocks..I am so lame..lol) and has kept it ever since. I call it my lucky rock! 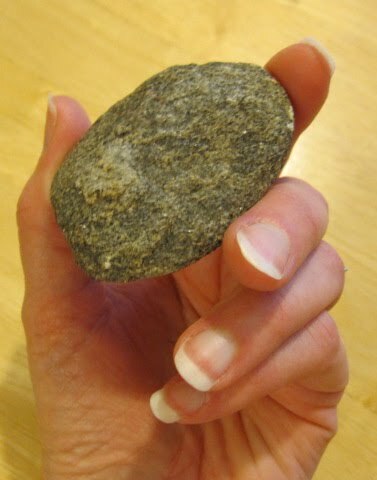 My son has his own pet rock that sits prominently on his desk as it holds a very special meaning to him and him alone. I hope someday he will share it with us. Until then…. I can't believe you still have it after all these years! It's the little things that usually mean so much and who would have thought that your pet rock would be such a cherished part of your childhood. Thanks for sharing and take good care of your pet!